266 Bikes For Kids in 2017 Thank you to 86 volunteers who make the 11th edition of Bikes For Kids a great success! 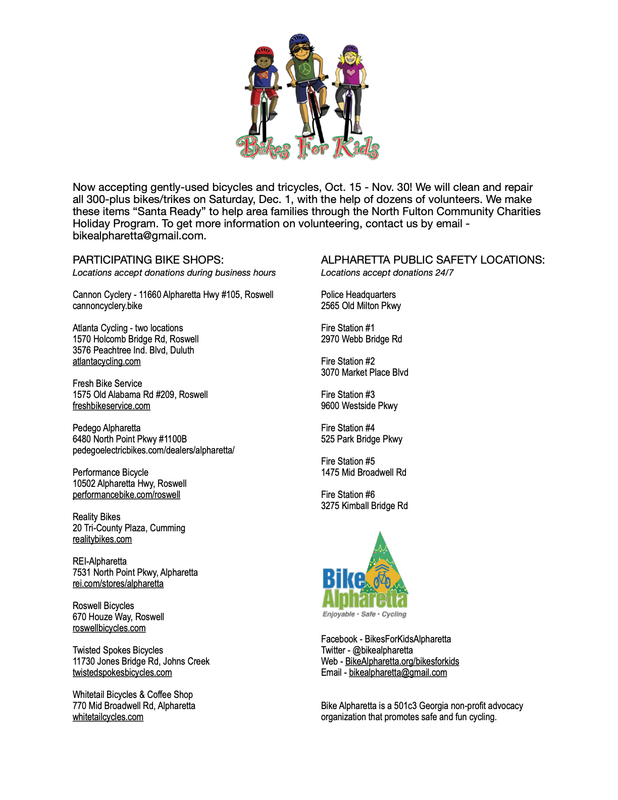 A total of 266 new and refurbished bicycles/tricycles were provided for the Holiday Program at North Fulton Community Charities. Another 30 bikes were repurposed for Sopo Bicycle Collective in Atlanta. And we provided 275 new helmets and 100 bike locks for the Holiday Program as well, thanks to all our donations. 160 Bikes Now Santa Ready! Bikes For Kids – Cleaning 266 Bikes/Trikes! We closed donations for 2017 on Dec. 2. However, we should be able to accept bicycle donations again beginning the Spring 2018 when we gain access to a storage facility. Do you still have the mountain bike for donation? Thank you! I have an older Specialized Mountain Bike I would like to donate. Are you still accepting donations for kids in need?